I grew up not far from New Orleans. Growing up, I considered it (aside from the Ms. Gulf Coast) one of the very important safe havens from the toxic nature of my childhood. It truly offered a home. I made friends with numerous natives of both New Orleans and the Gulf Coast. I loved both places. Still do. I mourned greatly when the BP Oil Spill happened. And though I know forgiveness is a necessity, I’ve not gotten to that point yet. I hope and pray I do one day. I played in several garage bands growing up. That was also a nice escape from the insanity of the dysfunction behind the noise. It took me to another place, so I worked hard to learn to play better. And though I never got to the point where my music would transport me physically to another place, a bigger place, a safer place; it did, at least for a few hours “take me away”. I remember when The Graduate was released in December 22, 1967. My favorite radio station WXXX, which normally played pop and loud rock, was now saturating the airwaves with their harmonic voices with songs such as Sounds Of Silence and Mrs. Robinson. The big surprise was that I liked that sound. I was told I probably would by people who worked in the music industry. I very much was. I remember once, at about age 13, when I wanted to buy that album and about 3 other albums. I couldn’t afford them all and joked to a friend, “I can’t buy them all ’cause I am just a po boy”. Though it was just a dumb pun at the time, I wrote it down as I wrote down nearly every pun or “turn of a phrase” I wrote or conceived. I didn’t know why, but I figured one day I might use them for something. When I started Londons Times Cartoons in 1997, I pulled out my trusty shoebox of about 4000+ concepts, scribbles, puns and the like that I had written and saved over the years. I had no idea at the time what I might do with them one day, but felt I better save them. Though this one was not fleshed out (yet), I spent a little time on it and this was the result. 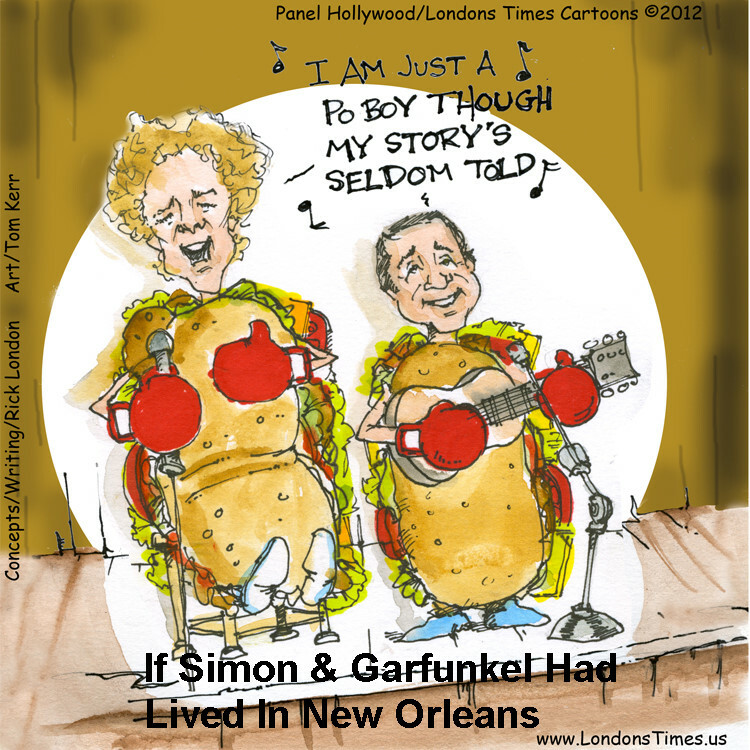 People enjoy our Cajun Simon and Garfunkel graphic on tees, mugs, office products, glassware, bed and bath, greeting cards and all kinds of other fun products. Rick London is an author, songwriter, and cartoonist. He is best known for his Londons Times Offbeat Cartoons and Funny Gifts which he launched in 1997.